In celebration of National Bike Month and Bike Week L.A. (this week!) we’ve launched a new survey series entitled ‘Why I Cycle.’ This series spotlights local bicyclists who have made the daring leap from car-dependent to car-free or at least car-light in Los Angeles. Of particular interest to Metro is bike-to-transit behavior. The results: 49% of Why I Cycle survey respondents said they bike to fill a commuting gap – the fabled “last mile” dilemma. Many people use a mix of transit but Metro Rail received the most votes, followed by Metro Rapid and Local buses. 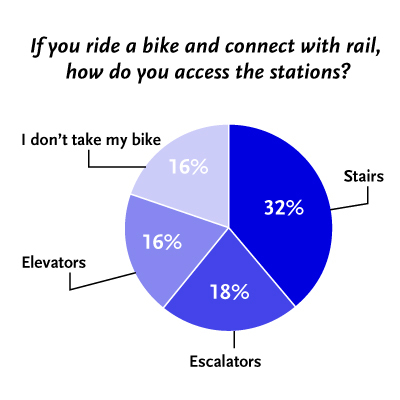 We asked Metro Rail riders how they access stations with their bikes. Results: 32% said they use the stairs, 18% use the escalators and 16% use the elevators. The remaining 16% said they don’t take their bikes on the train. The large percentage of cyclists who access Metro rail stations using the stairs will be happy to hear that thanks to feedback at Metro’s Bicycle Roundtable, special stair channels for bicycles will be considered in the design of new Metro stations. The under construction El Monte Transit Station will be the first station to implement stair channels. We also asked for specific ideas on how to improve bike-to-transit connections. Many said they’d like to see rail cars added that are solely dedicated for bicycles. Others complained that turnstiles made it difficult to enter stations and that wider gates should be installed. Bus racks capable of holding three bikes was another common suggestion. 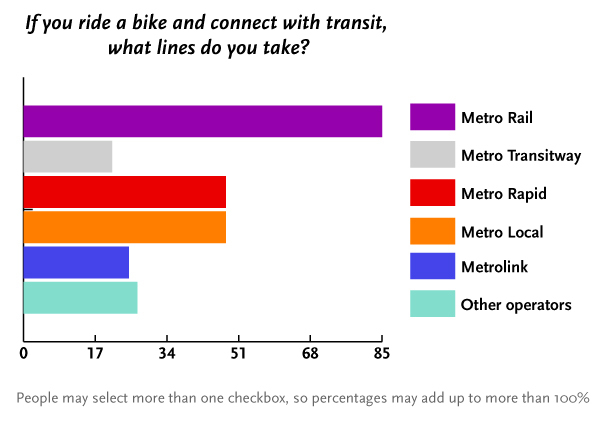 After the jump, more thoughts from survey respondents on how to improve the bike-to-transit experience. I second the idea about the need to make it clearer to passengers that the area without seats is for bikes, not just for standing people. The current signs (picture icons), while stylish, are too abstract to get the point across. Lots of people in my experience block the bike area, leaving bikers who are less confrontational to hold their bikes near the doors, where they’re less stable and pose more of a safety hazard for others, as they’re not stopped against the wall. Bravo, though, to Metro, for taking out these seats and making the space for bikers. Follow-through on new signage would be helpful to bikers. Perhaps signs like the disabled seating signs would be helpful — ie, explicitly stating, please give up this space for bikes. The signage last time I took a bike on rail was too subtle for passengers, apparently!